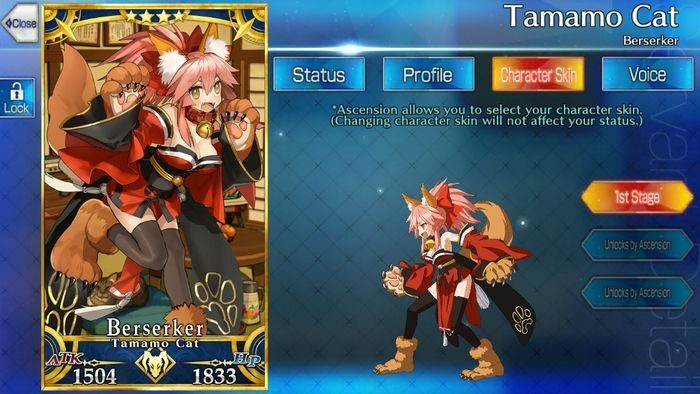 This article contains the stats, strategy, and guide for Berserker - Tamamo Cat. WE WILL UPDATE THIS AS SOON AS THE GAME COMES OUT. Tamamo Cat is a Berserker-class Servant with a powerful all-target Noble Phantasm and good self-buffing skills. However, she lacks any evasion or invincibility skills, so she is more vulnerable to attacks. Tamamo Cat’s Noble Phantasm, Napping in the Dazzling Sunshine and Feasting, is a doubled-edged sword. It’s powerful and hits all enemies, but it also leaves Tamamo stunned for 2 turns. On the flipside, she regenerates HP for 3 turns, so she’s not entirely vulnerable during that time. What’s important is to time the usage of her Noble Phantasm well in order to make the most of it. With 3 Buster Command Cards, 1 Arts Command Card, and 1 Quick Command Card, Tamamo can pull off a Buster Brave Chain all by herself, allowing her to deal significant damage to single targets. For her skills, focus on leveling up Monstrous Strength, because this is a very powerful buff that she can use before firing off a Buster Brave Chain on bosses, or her Noble Phantasm on mobs. Tamamo Cat pairs well with Marie Antoinette, because her Noble Phantasm, Guillotine Breaker, removes the debuffs for the party. Thus, you can fire off their Noble Phantasms one after another: Napping in the Dazzling Sunshine and Feasting can be used to hit all enemies, and then Guillotine Breaker can clean up by hitting everything and then removing the stun on Tamamo. Saint Martha is another good partner for Tamamo Cat, because her skill, Miracle, removes the party’s debuffs, as well. Her Noble Phantasm is also very compatible, because Tarasque hits all enemies and lowers their defenses, softening them up for Napping in the Dazzling Sunshine and Feasting to hit right afterward. Also, if Tarasque is selected first, it will boost all damage even further, because it is a Buster card. Overall, Tamamo Cat needs some good support to overcome her weaknesses, but she can wreck havoc on the battlefield if allowed. Kaleidoscope lets Tamamo Cat use her Noble Phantasm almost right off the bat, with an 80-100% NP gauge at the start of the battle. The Imaginary Element or Plentiful Harvest can substitute for Kaleidoscope, but they are weaker alternatives. Primeval Curse gives a chance to resist the stun debuff, if your party has no other ways to cover it for her. On the other hand, Heaven’s Feel strengthens the power of Tamamo Cat’s Noble Phantasm, with a 40-50% NP Damage increase. Dragonkin also serves as a weaker alternative, with a 15-20% NP Damage boost. Overall, Tamamo Cat greatly appreciates either NP Gain, NP Damage, or debuff-removal, so plan accordingly. Madness Enhancement C Heightens damage of unit’s Buster Cards by 6%. Monstrous Strength B 2 7 Heightens self’s Atk. Curse E – 7 Chance to lower 1 enemy’s NP gauge by 1. Morph B 3 7 Raises self’s Def for 3 turns. Regenerates HP each turn for 3 turns. Belongs to the Tamamo Nine, one of the severed tails that escaped and became a separate Heroic Spirit entity. Tamamo’s representation of innocence and sincerity, her behavior is comparable to a wild cat making her unpredictable. Classified as a wild beast, once she pledges allegiance to her “lord,” the contract is bound. She becomes a companion who wants nothing but to serve her Master. In time, as the Tamamo Cat becomes acquainted with her services to the “lord,” she will not cease to gratify him, even to the expense of her own happiness. Her Berserker form is driven by instinct, satisfying herself with nibbling delicious food, frolicking, and hunting. Unlike Tamamo-no-Mae, Tamamo Cat is more muscular and weighs heavier. Hey, slight issue. The mash kyrelight link under servant tiers brings you here.